Sears' CEO and majority owner Eddie Lampert is offering to buy the Kenmore brand and some other assets from the troubled retailer. Lampert's offer letter to the company he controls says he's making the bid because the company hasn't been able to find another buyer for the assets in the two years they've been on the market. "Kenmore is an iconic brand with substantial value, and Sears should aggressively pursue a divestiture of all, or a portion of, Kenmore in the near term," said the offer letter. 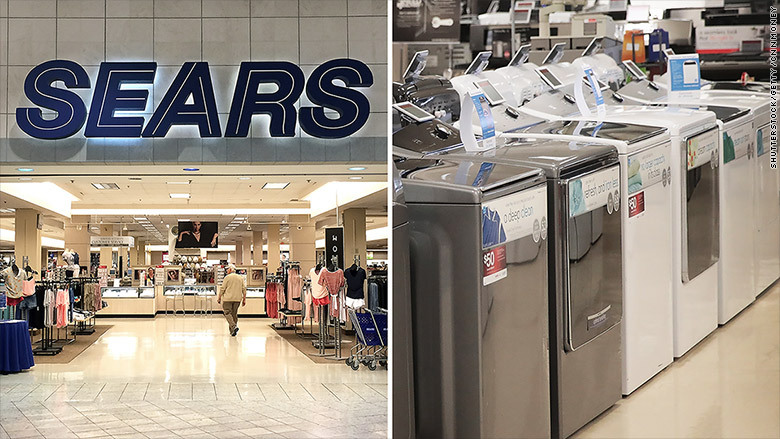 "Pursuing these divestitures now will demonstrate the value of Sears' portfolio of assets, will provide an important source of liquidity to Sears, and could avoid any deterioration in the value of such assets." Sears has been struggling for years, losing $10.8 billion since 2010, its last profitable year. It defaulted on some of its debt earlier this year when it got lenders to accept an extended repayment schedule. The offer is from ESL Investment, the hedge fund owned by Lampert that holds more than 70% of the shares of Sears Holdings (SHLD), which operates both the Sears and Kmart brands. ESL is also a major lender to Sears. Lampert said he won't negotiate this deal on behalf of Sears to avoid a conflict of interest. His letter also makes clear he doesn't necessarily want to buy these assets -- he'd be perfectly happy if someone else does. He's hoping his offer will drum up some interest. His offer letter also expresses interest in buying some or even all of Sears' remaining real estate, as well as its home service and parts businesses. It doesn't put a dollar figure on what he's willing to pay -- the letter says those specifics will come later. Lampert does say he values the Sears home service and parts businesses at $500 million, but declined to say what he thinks Kenmore is worth. "The letter from ESL will be reviewed and considered by a committee of independent directors of the company's board," said a statement from Sears. "There can be no assurance that this letter will result in a transaction or on what terms any transaction may occur." Kenmore is widely believed to be one part of the Sears business that could stand alone even if the retailer goes out of business. Sears started selling Kenmore appliances on Amazon (AMZN) last year, the first time it has sold that brand through any other retailer. Last year, Sears sold its Craftman tool business to Stanley Black & Decker (SWJ) in a deal valued at about $900 million. And Craftsman tools will start selling later this year at Lowe's (LOW), one of Sears' biggest rivals. Lampert continues to insist that the company will soon return to profitability. But to do that, it will need more cash. Last year the company admitted in a filing that there is "substantial doubt" about its ability to remain in business.